BP’s Valhall field in the North Sea is undergoing major developments in order to extend its lifetime. The troubled project with a water injection platform has been well covered in the news. But there is another, very successful, project going on as well – the North and South Flank development. Production will start from the South Flank early next year. Valhall Flank Development (VFD) consists of two unmanned wellhead platforms each equipped with 16 drilling slots and located about 6 km (one to the North and one to the South) from the existing Valhall Facilities, where wellstreams will be processed. The North and South flank project at Valhall is a major investment, totalling approximately NOK 4.5 billion. 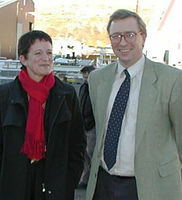 It is headed by Project General Manager Birte Noer Borrevik. 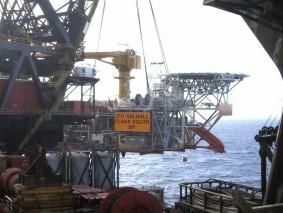 The most visible part of this development is the two twin wellhead platforms, costing just above NOK 1 billion. ‘They are important elements of the project, but in many ways the most straightforward parts of it,’ says Borrevik. She points out that extensive modification work is being done to the Valhall centre, as well as pipelaying work. ‘Not to forget the drilling, which counts for as much as 60 – 70 percent of the total project costs,’ she says. No wonder BP chose a drilling engineer to head the project. Birte Noer Borrevik started her carrier at Statoil as a drilling engineer when she was 21 years old. She worked offshore for several years. In 1993 she went to Amoco and was given responsibility for their drilling engineering service for the North Sea, before being chosen to head the Valhall Flank Project. The drilling has started on Valhall’s South Flank. West Epsilon from Smedvig has already been at work there for several weeks. Production is planned to start on the South Flank in March – April 2003. Exactly when will be decided by the progress of the drilling work. The initial plan for the flanks calls for eight wells to be drilled on each flank. How many will be drilled at the South flank before the drilling rig is moved depends on how time-consuming the drilling proves to be. Costs are cut as much as possible at the Valhall flanks development, but the environment is not forgotten. The drill cuttings are reinjected instead of being taken to deposits onshore. ‘We find it is well worth taking the extra cost of reinjecting the drill cuttings, in order to carry out this operation as environmentally friendly as possible,’ says Borrevik. The Twin platforms are so called because they are supposed to be exact copies of one another. The Nort flank platform is now being made as a copycat version of the South flank. One of Borrevik’s challenges with this project is therefore to control the engineers’ natural strive for innovations and improvements. She gives a laugh when describing it, but underlines that the issue is very serious. ‘We all have an urge to do our best. When we see something we feel might be an improvement we want to implement it. But the costs estimates of the two flank platforms are based on making two exactly similar platforms,’ she says. That does not mean she is deaf to sensible suggestions. Through the production of the South flank engineers both at BP and Hereema came across details they suggested to change. ‘We have made a couple of minor changes. But as we don’t want to cross the tight budget line the threshold for getting any suggestion accepted is extremely high,’ Borrevik says. She also underlines that the contract with Hereema is based on a streamlined production of two equal platforms. Managing Director at Heerema Tønsberg Gunnar Amundsen, is very satisfied with the Valhall twins. ‘This is a perfect project for us,’ he says, showing us the hall where work has just begun on the second platform. ‘All work is done in close co-operation,’ Borrevik and Amundsen agrees. But Borrevik points out she does not visit Heerema too often. ‘I rely on their expertise,’ she smiles. According to current plans the North Flank Platform will leave Tønsberg in June 2003, and start drilling in the autumn. Production on the North Flank is due to start in early 2004. In addition to the new elements being installed at the field, extensive modification work is being carried out at the Valhall centre. In fact, that is the only area where Borrevik’s project corresponds with the water injection project. ‘We are ensuring that we are not doing the same things twice, so we are co-ordinating the modification work together with the people from the Water Injection Project,’ Borrevik explains. The delay of the Water Injection Platform means that the Flank Platforms has to rely on their own generators for electricity for a longer period than planned, as they are supposed to get el-supply from the Water Injection Platform in the future. ‘That does constitute an increase in expenses, but only a minor one,’ Borrevik underlines. Several sub-contractors are taking part in this major BP-project. The particle detection technology of the Norwegian based company, Roxar Flow Measurement AS (RFM), has been selected for both the Valhall South Flank and North Flank installations. Heerema placed ‘copy-cat’ orders for the two platforms, a total of 26 detectors, 12 sand detectors and 1 pig detector for each. The packages were delivered on time. ‘Chalk in the production lines had become a challenge for Valhall operators as early as 1994-5 when Amoco contacted RFM (then as Fluenta) and asked if the company’s SAM 400 series particle detectors could be used to monitor chalk production,’ RFM’s Suzanne Hodgson says. Rather than play guessing games, the two companies conducted joint trials to find the answer. Despite the very small particle size of the Valhall chalks, the answer was a clear ‘yes’. Orders for detectors for both the WP & DP platforms followed in quick succession. Detectors were later also supplied to the water injection platform. With the latest Heerema orders, RFM have supplied around 50 detectors to Valhall. Another Norwegian supplier to the Valhall project is Umoe Schat Harding AS. They have delivered FF900, free fall skid life boats for the South Flank and will deliver the same lifeboats also to the North Flank during the spring 2003. The company has also delivered lifeboats to the Valhall Water Injection Platform. Recently Umoe Schat Harding was awarded a contract for the delivery of lifeboats to Statoil’s Krisitn platform. Markhus A/S in Grimstad has supplied prefabricated modules for the Valhall flanks. Markhus has developed a system of prefabricated modules for the marine and offshore market, called Flexmodules, which was chosen for Valhall. The delivery to the Valhall project included emergency overnight accommodation for 12 persons, offices, workshop, battery, HV, LV, LER and HVAC rooms. A single, double and triple level formation was utilised together with associated access systems. The total floor area of the modules is 325,0 m2 and the total weight is 82,5 tonnes. The two unmanned wellhead platforms at the Valhall flanks are to be powered from the Valhall Injection Platform by subsea cables supplied by ScanRope Subsea Cables AS. The subsea cables consist of three 10kV 95mm2 power cable cores and a 24 fibres optical signal cable. The ScanRope Subsea Cables delivery also includes a complete system for interfacing the platforms, such as J-tube seals, pull-in heads, hang-off systems and platform junction boxes and splices. The subsea cables are laid on the seabed, ready for pull-in on the Flank platforms. Each cable is approximately seven km long and interfaces the platforms through J-tubes from the seabed and up to the topsides. ScanRope Subsea Cables AS is a supplier to the oil and gas industry of subsea power cables, umbilicals and terminations, which also offers service during installation and operation. Their products are used for hydraulic operations, fluid-, signal- and power distribution between shore, subsea and topside installations. SSC’s experience relates back to 1986, then organised under ABB. The acquisition of the Subsea Cable Division from ABB was made by ScanRope AS in Tønsberg, 1st February 2002.